"Irish Cooking Queen" Rachel Allen introduces American public television viewers to her straight-forward yet stylish dishes in her new series, RACHEL'S FAVORITE FOOD AT HOME. 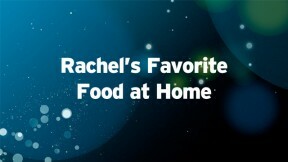 Shot entirely in her own kitchen in County Cork, Ireland, Rachel draws on family favorites, classic regional fare and international influences to provide creative options for many occasions - a simple family meal, a festive supper, a romantic dinner for two, or a hearty picnic. Some of her delicious, inspiring and easy-to-follow recipes include: South American beef steak with chimichurri salsa, oven-baked risotto verde, lamb samosas, soda bread scones and a summer fruit tiramisu.